This library guide was developed in collaboration with Thomas Mangloña II, Betsy Rohney, K.L. Parker, and Carly Kajiwara, members of Oceania Asian Pacific American Student Development center, and Sine Hwang Jensen, Asian American and Comparative Ethnic Studies Librarian at the Ethnic Studies Library. The guide serves as a starting point for researchers, community members, and students interested in Critical Pacific Islands Studies. 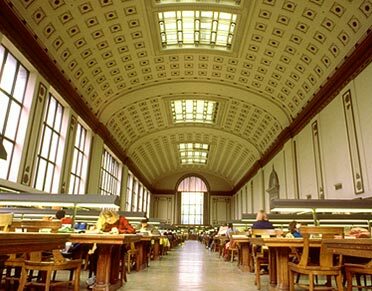 The guide highlights resources from the UC Berkeley library collections but also provides links to materials found at other institutions and freely accessible elsewhere. While there is no formal Pacific Islander Studies program at UC Berkeley, Pacific Islander Studies draws from disciplines such as Ethnic Studies, Anthropology, Sociology, Literature, and more. To create a research guide on Critical Pacific Islands Studies also brings into question what "research" really means and how Western research has been an integral part of the violence of colonization. Knowing that academia has tended to privilege the written and printed word, this guide also acknowledges oral histories, art, music, and other ways of knowing and sharing knowledge as just as if not more legitimate and important. One may notice that traditional academic disciplines such as Anthropology and History are not as prevalent in this guide. Rather than highlight uncritically resources in these fields which have tended to exploit Pacific Islands communities, this guide prioritizes work by and for Pacific Islands people and communities, especially in fields such as Ethnic Studies. Please check back often as this library guide will be continually updated. If you would like to provide any feedback or suggestions to this guide, please fill out this short google form. Image Text: "Our story remains unwritten. It rests within the culture, which is inseparable from the land. To know this to know our history. To write this is to write the land and the people who are born from her." 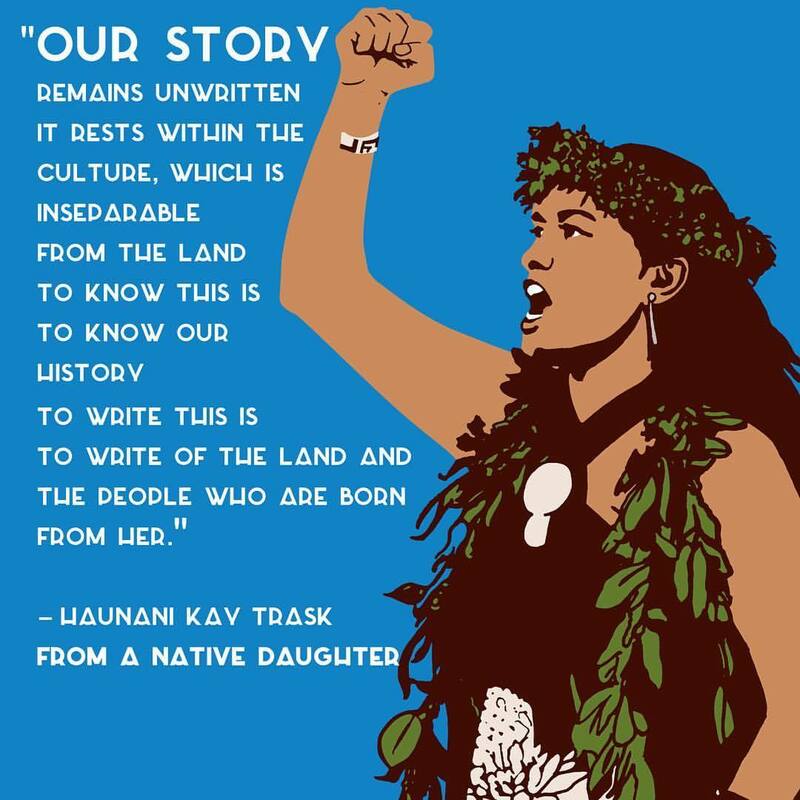 - Haunani Kay Trask, "From a Native Daughter"
As described by the City College of San Francisco, "Critical Pacific Islands Studies is the critical analysis of Pacific peoples and cultures in the U.S. diaspora and beyond examining colonization, imperialism, militarization, social movements, and immigration through academic and community-based scholarship and practices." The discipline privileges the diverse voices of native Pacific Islanders and is interdisciplinary at its core. There is also growing use of the term “Oceania” to describe Pacific communities and their relationship with the land and ocean, not simply as island people but also Ocean people and not just as island nations, but Ocean nations, departing from the language of colonization. While Pacific Islands courses and seminars have existed within Ethnic Studies, Anthropology, and other departments, there is currently no formal academic program for Critical Pacific Islands Studies at UC Berkeley. Students and alumni throughout the years have advocated and fought for an established program which continues to this day. This guide highlights resources from the UC Berkeley collections but also provides links to materials found at other institutions and freely accessible elsewhere. While it is intended to help users navigate the UC Berkeley Library system, it is also intended to provide resources for community members on learning more about Critical Pacific Islands Studies in general. It prioritizes resources by and for Pacific Islanders. The Critical Pacific Islands Studies Certificate of Accomplishment introduces students to a critical analysis of Pacific peoples and cultures in the U.S. diaspora and beyond. Privileging the voices of native Pacific Islanders, the interdisciplinary curriculum explores a plethora of historical and contemporary topics, including colonization, militarization, social movements, and immigration, through the use of academic and community-based scholarship. All required courses are University of California (UC) and California State University (CSU)-transferable and meet City College of San Francisco General Education (GE) area requirements A (Communication & Analytical Thinking), C (Natural Sciences), D (Behavioral and Social Sciences) E (Humanities), H1 (Ethnic Studies). The Critical Pacific Islands & Oceania Studies Certificate of Achievement is an 18-20 unit certificate that introduces students to a critical analysis of Pacific peoples and cultures in the U.S. diaspora and beyond. 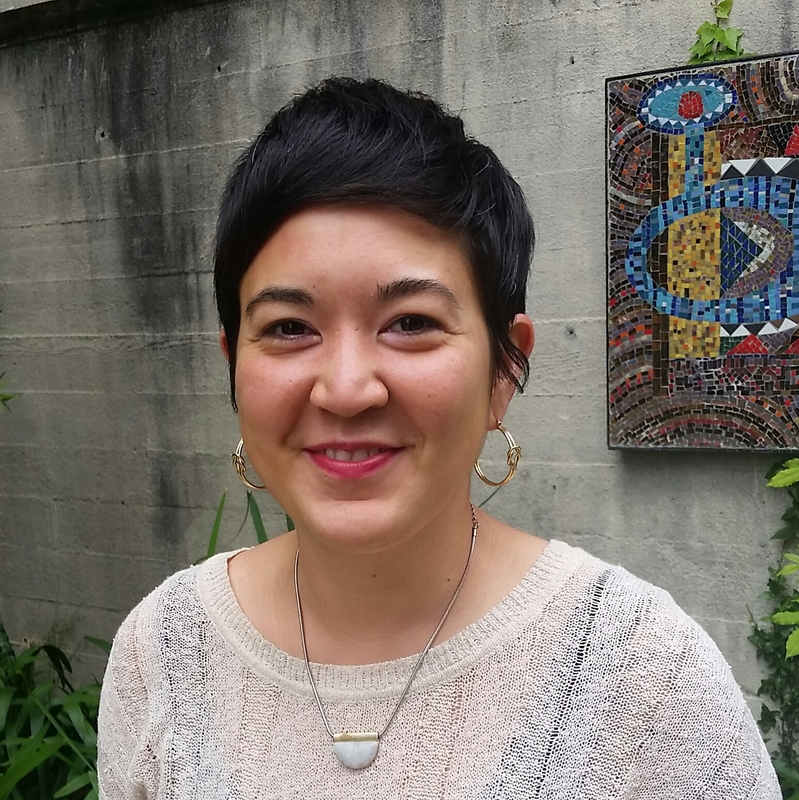 Privileging the voices of native Pacific Islanders, the interdisciplinary curriculum explores historical and contemporary topics such as colonization, militarization, social movements, and immigration, through the use of academic and community-based scholarship. All required courses are University of California (UC) and California State University (CSU)-transferable and meet College of San Mateo General Education (GE) area requirements. Although the certificate is ideal for those whose careers involve working with native Pacific Islanders and other communities of color such as service providers, health practitioners, law enforcement, researchers, teachers, and other professionals, the primary goal is to encourage students to further their educational aspirations through the completion of an associate's degree and successful transfer to a four-year university. The Center for Pacific Islands Studies, in the School of Pacific and Asian Studies, is both an academic department and a larger home for initiatives that bring together people and resources to promote an understanding of the Pacific Islands and issues of concern to Pacific Islanders. This site seeks to make available online instructional materials for teaching about the Pacific Islands, primarily in higher education. The site includes course descriptions, reading lists and bibliographies from specialized courses on the Pacific as well as non-specialized courses that may facilitate teaching about the Pacific in general humanities and social science curricula. The syllabi and bibliographies date from the 1990s to the present. The University of Auckland offers undergraduate, postgraduate, and doctoral study in Pacific Studies. The Ethnic Studies Library is the departmental library of the Department of Ethnic Studies. It was established in 1997 by merging the Asian American Studies Library, the Chicano Studies Library, and the Native American Studies Library. Since the founding of the Department following the Third World Liberation Front student strike in 1969, the collections of these libraries grew from student interest in collecting and preserving a perspective by and for racialized communities that they saw as lacking or marginalized in other campus libraries. The specialized ethnic studies books and serials, archival collections, posters, and audio collections from those three libraries live on in a centralized space on the ground floor of Stephens Hall, a short walk from Barrows Hall. The library consists of these four collections: Asian American Studies Collection; Chicano Studies Collection; Native American Studies Collection; Comparative Ethnic Studies Collection. In addition to our collections, the ESL regularly hosts events, ESL librarians provide reference and instruction for the department and larger campus community, and takes recommendations on purchasing books in the field of Ethnic Studies. Visit the Ethnic Studies Library website for more information. Community users are welcome to use the Ethnic Studies Library archives and facilities. In addition, there are six public computers which allow access to selected UC Berkeley library databases. Books can only be checked out by cardholders. Community members and students at other universities or colleges may also have access to UC Berkeley library card. For more information, visit the library resource page on Library cards for non-UCB patrons. The Comparative Ethnic Studies Program, one of the programs under the Department of Ethnic Studies, is founded in the understanding that the study of race should be grounded in a deep understanding of the particular historical, social, economic, cultural, and political experiences of individual racialized groups as well as an analysis of the relationships among them. Established in 1975, our Comparative Ethnic Studies (CES) program builds on and extends beyond the groups covered in our other majors by analyzing the multiple and intersectional ways in which groups are racialized, operate within and contest various forms of power, and build alliances. Collectively our faculty provide a wide range of interdisciplinary analyses across geographical areas, among various racialized peoples, and with other markers of social difference such as gender, class, and sexuality. Our CES program enriches the study of individual racialized and indigenous groups and has long provided a model for the development of other Ethnic Studies departments across the country. Need help?? Contact a librarian! Research help: 24/7 chat, in person, by e-mail, etc. You can suggest items that the Library should consider purchasing. Use the Purchase Recommendation form to submit your suggestion.